Imagine a notebook with papers inside that are white as a field of snow polar bears walk, rough as a desert where camels travel, pockets that resemble a kangaroo, and even an envelope with window were you can put anything like the bees carrying pollen to a flower. Spiral Ring Notebook is not an ordinary notebook. It’s a notebook consisting of unique papers and envelopes that stimulates people’s creativity. Try writing your thoughts, draw images that come up to your mind, paste papers you collect while traveling, or even put them in a pocket or envelope. You can real-ize the ideas that are starting to pop up in your mind. Spiral Ring Notebook consists of a cover that contains resin, original papers or envelopes. 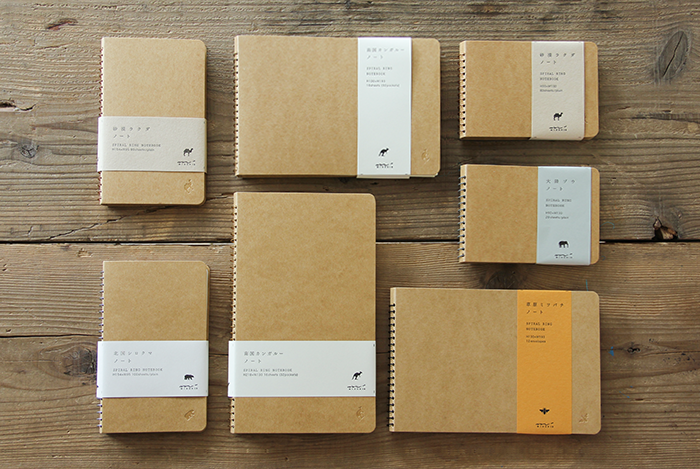 The paper that includes resin makes the cover strong, and the notebooks are bound by hand one by one neatly in our factory.